Czech tech site PC Tuning (Google Translation) claims to have tested a mystery new AMD processor while reviewing AMD's new 990FX chipset, which is very probably a new AMD FX (Bulldozer) chip. According to the site, the Gigabyte 990FX motherboard was tested with both a Phenom II and a processor model 'without a name', which runs at 3.2GHz by default and at 3.7GHz with all the cores in Turbo Core mode. The site claims it had just enough time to run some game tests on the system, and compare it directly to the performance of Intel’s current flagship LGA13366 Core i7-990X processor. Both chips were overclocked to 4GHz for the test, and both test platforms had a quad-SLI setup using GeForce GTX 580 cards. As you can see from the performance results below, the Bulldozer system isn't far off the pace of the Intel system, but it's still notably lagging behind in every test. 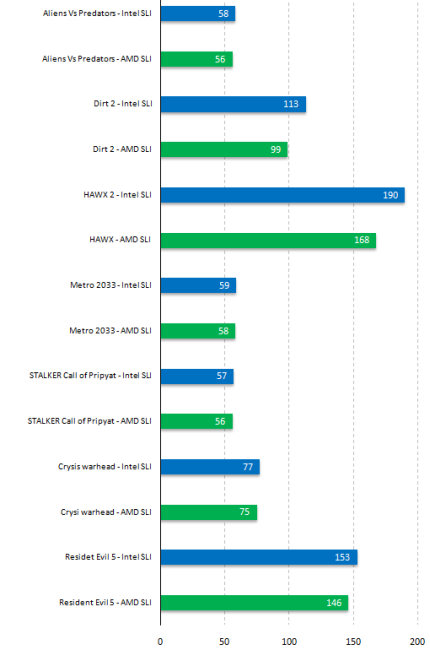 What's more, its performance in Dirt 2 and HAWX 2 was significantly behind the speed of the Intel system. However, the site claims that the processor is an early engineering sample; a claim which is conceivably true given that we saw a working Bulldozer system last week. The publication also stresses the fact that it was using Beta SLI drivers for the motherboard, as WHQL drivers haven't been released yet. Of course, these high-res SLI games tests only measure one aspect of the processor's performance too, and we've yet to see how the architecture fares in other software tests. Would you be tempted by an AMD FX system with this level of performance? Does the Bulldozer architecture have any hope of competing with Intel's Sandy Bridge and LGA2011 processors? Let us know your thoughts in the forums.